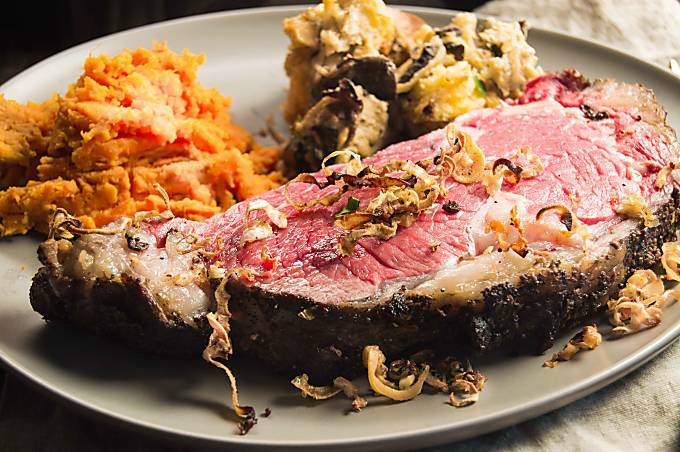 Horseradish Crust Ribeye Roast: A meal you will feel like you are at the fanciest restaurant. Flavored with mustard, fresh horseradish then cooked in the oven to yield tender, juicy prime rib roast for an easy meal for entertaining for the holidays. Today’s recipe for Horseradish Crust Ribeye Roast is a meal that will become a family go to for those times you want to serve something very impressive, but not have to worry about a lot of details in making it. It uses very few ingredient, most you will have on hand. 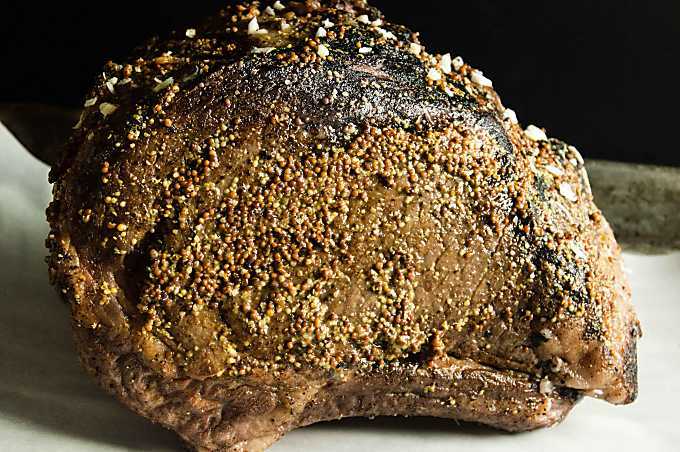 What is the difference between a Prime Rib Roast and a Ribeye Roast(or Rib Roast)? When making this meal when you go to the market you may see all kinds of roasts called many different things. There are roasts with bones in them and some without. You will see things marked as a standing rib roast, Prime Rib Roast, Ribeye Roast. You can use any of these for this recipe. “Prime” refers to the classification given to the cut of meat by the USDA. Prime is more expensive, because it is a better quality than other classifications. (Other classifications are select and choice.) You can use a Standing Rib Roast or a Ribeye Roast(Rib Roast). The terms are used interchangeably these days. All of these roasts are cut from the rib section, thus the name rib in their name. A Ribeye Roast is often served without a bone. The only thing to consider when buying bone in or boneless when it comes time to cook it is that the cook time will be a little longer with a bone in roast. No matter what you call this meal your guests, (or just your family) will absolutely love it. It’s always a treat in our house and pretty much shows up at any special occasion or holidays that we are having company over. How much Prime Ribeye Roast needed per person? Figure with a bone about one pound per person. You can also plan by how many bones are in the roast. One bone yields enough for 2 hearty servings, or 3 as a part of a meal with several sides. 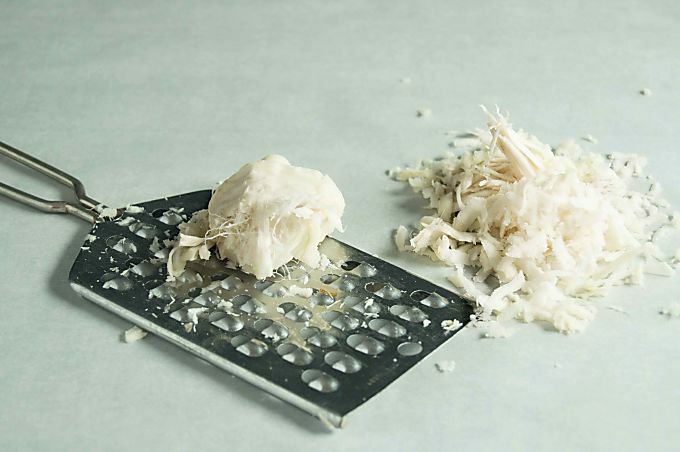 Where to find Horseradish root and how to prepare it? 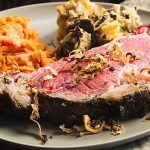 When making this recipe for Horseradish Crust Prime Rib roast you will need to purchase the horseradish root which is found in the produce section of your local market. It’s a root vegetable and it looks very nobby, and looks somewhat like a fat cream colored carrot with dirty rough texture. You will need to peel it and then grate it for this recipe. You can use a hand grater like I have shown in the picture below, or even put it in your food processor like this one here. 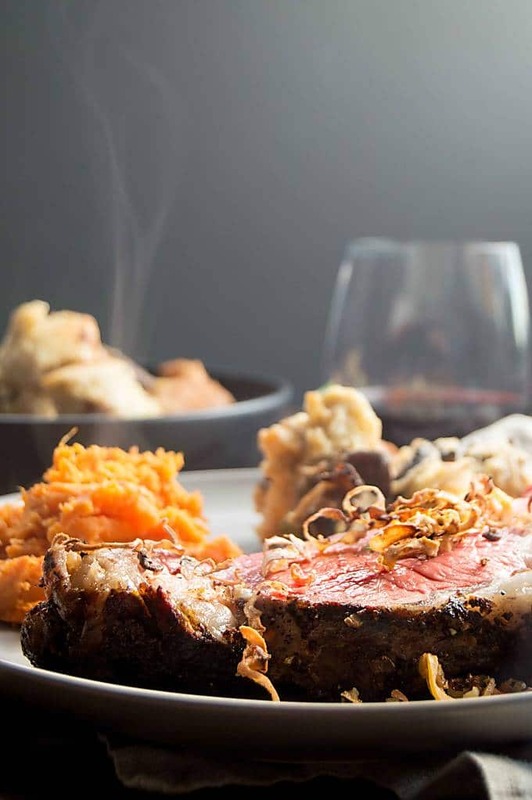 Since this Horseradish Crust Ribeye Roast is what we use for entertaining often I tend to use a spiralizer like this one here from Sur La Table. You’ll notice the horseradish comes off in nice spirally ribbons as you grate it. the horseradish in this picture is about 1/3 of what I had originally purchased, imagine a long fat carrot. Once you have your horseradish ready you will then season your Rib Roast or Ribeye Roast with seasoning salt and mustard and sear it before placing it on a pan to go into the oven. I place just a few small pieces of horseradish on at the time it goes into the oven. If you put it on too early it will burn. Here is an example of what the horseradish will look like once it comes out of the oven. Its crunch, flavorful and not at all hot like you think of horseradish would be. It makes this recipe not only a beautiful presentation, but the flavor is top notch! 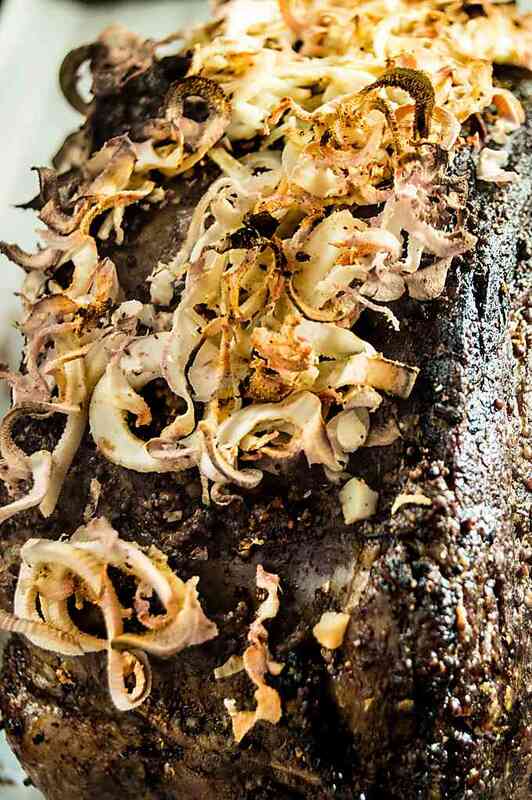 How long to cook the Horseradish Crust Ribeye Roast? In general you can figure cooking the prime rib roast on a higher temp for 20 minutes, then after that about 13-15 minutes per pound. You will want to have a thermometer on hand to be able to check it. Pay special attention when sticking the thermometer in to not touch the bone. If you want rare you will cook to 120°-125°, medium rare 130°-140° Medium 145°-155°. Be sure to pull out the roast about 5° before the final temp that you want to finish at. It will continue to cook while you rest it. If you have someone who likes their meat a little more done you can give them an end cut because the ends are more done. If that still isn’t enough and they want it more well done…(gasp, that is blasphemy in our house, but we do have one family member who LOVES it well done) you can place some au jus from the pan juices and pan cook it a little bit more. Be generous with the seasoning salt and mustard when you are seasoning the roast. The crust will get super crispy and you will be happy with how flavorful it is with the big bold beef taste. Dan at Plattertalk have a Cauliflower Gratin recipe in Horseradish sauce for something unique recipe that also has some horseradish in it so it works beautifully. My recipe for Creamy Scalloped Potatoes you can make ahead and just bake when you put the meat in the oven at the lower temp. Lemon Blossoms has a Sweet Potato casserole with a topping that you will want to have on everything. PIN THIS TO YOUR HOLIDAY MENU PLANNING BOARD for when you are looking for ideas to give at Christmas! Also Follow me on Pinterest to get more ideas to have for making easy delicious meals and appetizers for any entertaining! A meal you will feel like you are at the fanciest restaurant. Flavored with mustard, fresh horseradish then cooked in the oven to yield tender, juicy prime rib roast for an easy meal for entertaining for the holidays. Season roast on all sides with seasoned salt. Place olive oil in a skillet and heat to high. Sear all sides of meat for about 2 minutes each side. Remove to roasting pan. Generously rub mustard over all sides of the rib roast. Continue cooking for 30 minutes then check the roast with a thermometer to have it finish 120° for rare, 130° for medium rare or 145° for medium. Once rested, carve and serve immediately with sides and au jus poured over the top. This recipe is adapted from a recipe from Emeril Lagasse Horseradish Crusted Tenderloin. Cooking times for Prime rib. You can adjust the cooking times by the pound of the roast. Plan on 13-15 minutes per pound. Every oven is different, but using a thermometer will guarantee you get just what temperature you want to serve it at. My mouth is watering just looking at all of your photos…YUM! 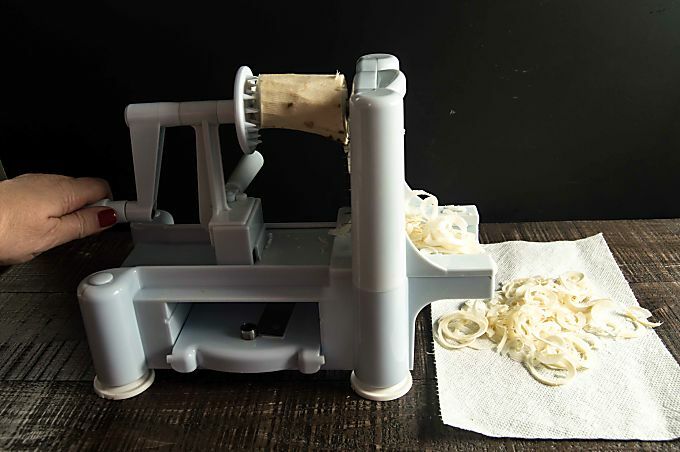 Such a smart idea to use a spiralizer for the horseradish. My husband is swooning for this recipe. Everything about it looks absolutely amazing. Okay my husband will LOVE this! Thanks for sharing! I can’t tell you how hungry this recipe makes me! It’s really a classic everyone should make. Everything about this is making my heart do a little pitter-patter! I’ve been looking for a recipe to make for the holiday’s and this is totally it! This looks amazing… so succulent!! I am fairly sure that this is what dinner dreams are made of! The crust looks amazing! Wow! What a great post filled with information about cooking techniques for cooking a Rib Eye Roast! I also love the recipe. The caramelized horseradish sounds amazing! This is a keeper! Pinned and on my holiday menu! This looks amazing – talk about a show-stopping holiday dinner! Especially with that gorgeous crust. I also really appreciate all of the info about different cuts of meat, servings, and cooking times – even for all the cooking I do, I can still be a little intimated by cuts I don’t really understand, so this is super helpful! Love the earthy tones to your images! And that rib eye roast looks delicious! There is nothing better than a ribeye roast on Christmas. This has been our tradition for several years now. We start early — we age it. Have you tried that? Makes all the difference in the world!! In the stores if you buy aged it’s about $10.00 more a pound. Your roast looks delicious. Oh my goodness the title alone had me sold and your pictures sealed the deal! I WILL be making this ASAP! Perfection! Horseradish and beef is so perfect together! A good prime rib roast is simply heaven this time of year! Great recipe! Lovely post!This would be so great for the Holiday gathering’s! We eat horseradish with almost every meal in Austria. We even have it in our regional mustard specialty! It goes so well with pork, beef and veal. I like the way you used the horse radish in your recipe as a ribeye roast crust. The house must be smelling so lovely when it’s roasting! I loooove anything with horseradish, so this really speaks to me. What a delicious option for a big dinner party! I love the flavor of horseradish. I have never purchased or used it whole, though! Looks delicious …very informative, too! New Years! The horseradish crust has me so looking forward to it!